A new Transparency Market Research report states that the global craniomaxillofacial implants market stood at more than US$1 bn in 2013 and is predicted to reach US$1.7 bn by 2022. It is expected to expand at a CAGR of 6.20% from 2014 to 2022. The title of the report is “Craniomaxillofacial Implants Market - Global Industry Analysis, Size, Share, Growth, Trends and Forecast 2014 - 2022”. As per the report, the increasing aging population, the growing number of road accidents, and the rising demand for customized craniomaxillofacial implants are fuelling the market for craniomaxillofacial implants. In addition, the rising count of centers for craniomaxillofacial surgeries globally is also augmenting awareness amongst the public on craniomaxillofacial surgeries and implants, thus fuelling the market for craniomaxillofacial implants. On the other hand, factors such as the soaring cost of craniomaxillofacial surgeries and the absence of proper health insurance schemes in emerging nations are predicted to impede the growth of the market. In terms of location, the market is segmented into external fixators and internal fixators. Amongst these, on the basis of revenue, in 2013, internal fixators constituted the biggest share in the market for craniomaxillofacial implants. The key factors responsible for the dominance of this segment include the better healing properties, lower infection risk, and steady nature of internal fixators. This segment is poised to rise at the highest CAGR between 2014 and 2022 owing to enhancements in the metallurgical formulation of these fixators, hence resulting in enhanced corrosion resistance properties. 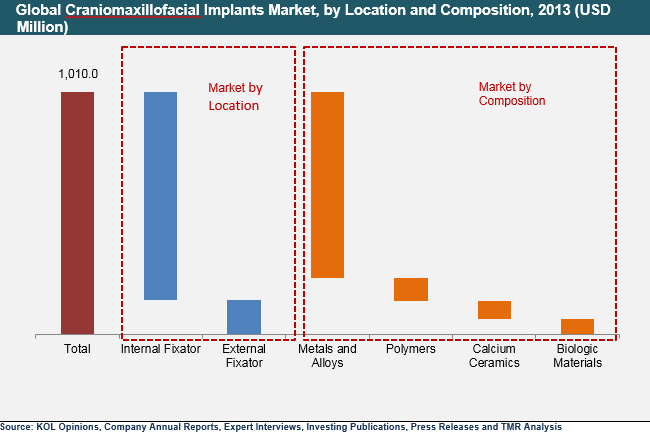 On the basis of composition, the craniomaxillofacial implants market is segmented into metals and alloys, calcium ceramics, biologic materials, and polymers. Amongst these, in 2013, the metals and alloys segment emerged as the largest segment on the basis of revenue. This is owing to the enhanced strength to weight ratio, improved osseointegration properties, and the enhanced biocompatibility of metallic craniomaxillofacial implants. On the other hand, the segment of biologic materials is predicted to witness the fastest growth in the forecast horizon owing to the resorbable and flexible nature of this material. On the basis of type, the market is segmented into bone graft substitutes, plate and screw fixator systems, TMJ replacement devices, and distraction systems. Amongst these, in 2013, the segment of plate and screw fixator systems led the market owing to the fact that these systems impose minimum damage to tissues and bones and thus are the most reliable method of internal fixation of cranial and facial bones. However, the segment of distraction systems is poised to rise at the highest CAGR from 2014 to 2022 owing to the rise in jaw deformities as a result of genetic disorders and road accidents. Geographically, the market is segmented into Europe, North America, Latin America, Asia Pacific, the Middle East and North Africa (MENA), and Rest of the World (Row). Amongst these, in 2013, North America led the market owing to the rising occurrence of facial injuries and the rising acceptance of craniomaxillofacial implants that are technologically advanced. On the other hand, Asia Pacific is predicted to experience the highest growth due to the growing aging population and increasing occurrence of hereditary facial abnormalities in the region. The key players in the market include Stryker Corporation, KLS Martin LP, Anatomics Pty. Ltd., Calavera Surgical, Matrix Surgical USA, Poriferous, LLC, GPC Medical Ltd., INION, INC., Ningbo Cibei Medical Treatment Appliance Co., Ltd., O & M Medical GmbH, and Osteotec Ltd.